Wild Wild West: The Great Train Heist Slot - ▶️ Win up to 50.000 Coins! The Wild West has fascinated and entertained our imaginations for decades and is still the subject of numerous films and novels. NetEnt has transformed this theme into an adrenaline pumping slot, packed with features. Wild Wild West: The Great Train Heist Slot is depicted as a comic book but boasts the usual NetEnt flair and style with extreme attention to detail. Wild Wild West is a 5-reel, 3-row video slot with 10 fixed paylines that features several gunslinging villains. Getting started playing is as simple as selecting your coin value and setting the bet level. Then, all you need to do is hit the Spin button, positioned in the bottom center, below the reels and which looks like a 6-shooter’s cylinder. Ready for Action? 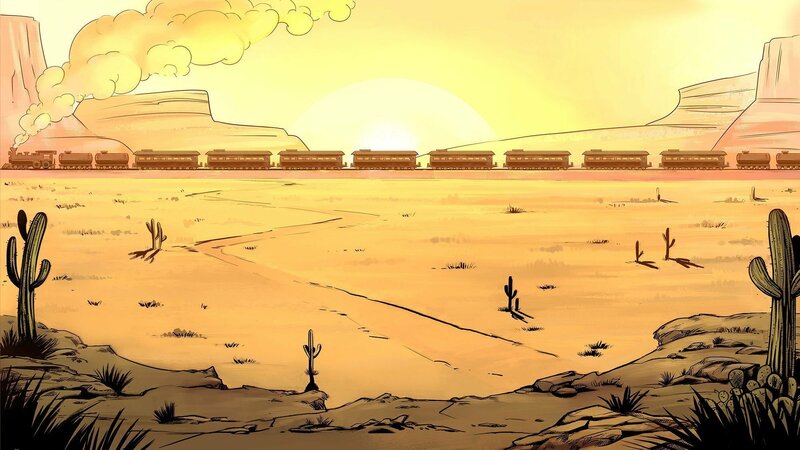 Grab your pistol and let’s go score some loot in the Wild Wild West: The Great Train Heist. 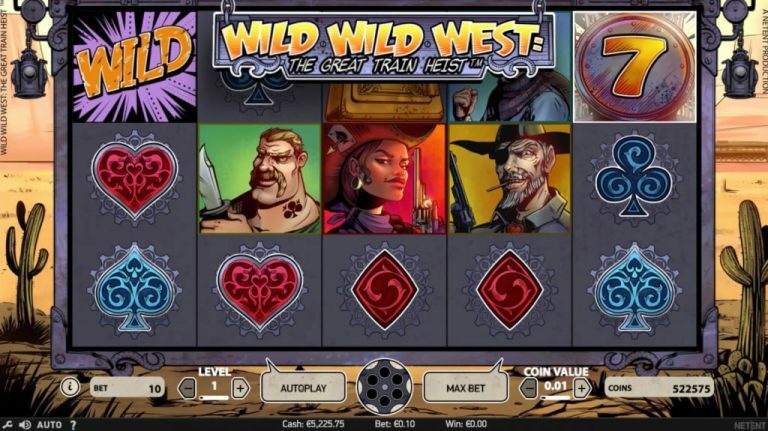 Wild Wild West stands out from other similar slot games due to its animated symbols, storyline, and 4 different wild features. It is an engaging slot which can keep a user entertained for hours. The backdrop of the game is exactly how you would envision a wild west scene, with a steam-powered train passing-by occasionally. The ornate steelwork around the reels also adds to the look and feel of the game. The slot uses 4 animated characters as high-value symbols which appear to be the members of the train robbing gang. A gun-toting senorita, with an Ace of spades playing card tacked to her hat and who looks like she really means business, is the top paying symbol, and will reward you a healthy 500x your bet amount for 5 on a payline. Next up is a mean looking cowboy with a patch over his one eye and a cigarette dangling from his mouth. Then there is “the muscle”, a thug looking character with an over-sized moustache and bowie knife, and finally, a scar-faced kid who looks ready to fight anything that moves. There are also other low-value symbols which include the traditional playing card symbols being, hearts, diamonds, clubs and spades. The orange and purple “Wild” symbol serves as the regular wild in this slot which substitutes for everything except the lucky “7” scatter. If you do happen to get 5 wilds on a payline, then brace yourself for a payout of 500x your bet amount. The scatter with a 7 on it, awards a free spins round when 3 or more scatter symbols appear anywhere on the reels. Wild Wild West: The Great Train Heist has a dedicated bonus feature called the Pick and Click Feature. The Pick and Click round begins when 3 Bonus symbols appear on the reels in the main game. You then get to pick one of the bonus symbols which reveals your coin win prize. The amount awarded varies between 5x and 50x your bet amount. Note that you only get 1 prize per Pick and Click round. The free spins feature is activated by landing 3 or more free spins symbols anywhere on the reels. Three scatter symbols awards 10 free spins, 4 scatters = 20 free spins and 5 scatters = 30 free spins. Regular Wild – substitutes for any other symbol except scatters. Expanding Wild – this wild expands over the entire reel to form even more winning combinations. X2 Multiplier Wild – this will substitute like a regular wild and double any payline wins. Spreading Wild – transforms 1 adjacent or diagonal symbol into an additional Wild symbol. Wild Wild West: The Great Train Heist does not have a fixed jackpot or progressive jackpot for that matter. It’s a pity that NetEnt didn’t include some kind of jackpot as they could have really tied the whole theme together with a big “loot” jackpot. Even though this slot does lack a jackpot, there is still potential to win huge sums of cash. Playing max bet could see you walk away with up to 50,000 coins by getting 5 top paying symbols on a payline. This slot has 10 fixed paylines. Wild Wild West has a theoretical return to player ratio of 96.70%. Wild Wild West: The Great Train Heist has a medium volatility. You can expect some decent main game payouts and to play the feature rounds from time to time too. This slot is well designed, has a good theme and is easy to play. The music and animations are well suited and the feature rounds make for good fun and payouts. NetEnt has done a great job, but they probably could have thrown in a few more features, or as we mentioned, maybe even a jackpot. Irrespective, Wild Wild West: The Great Train Heist will attract a wide audience and is definitely worth giving a try. Now you can score some loot without being an outlaw by playing Wild Wild West: The Great Train Heist at Rizk!